Gastro Obscura, the food section of Atlas Obscura, is always a good read for some of the odder chapters from culinary history. Recently the site asked its readers to send in the strangest items from their own cookbook collections, and what arrived was a treasure trove. There’s The Dracula cookbook, with items from the Count’s homeland, and of course a celebrity nod with Liberace Cooks! You’d wonder if some of these weren’t made up if readers hadn’t sent in their own photos, with guides to how to cook on your car engine, carve up a human body, or add insects to your diet. 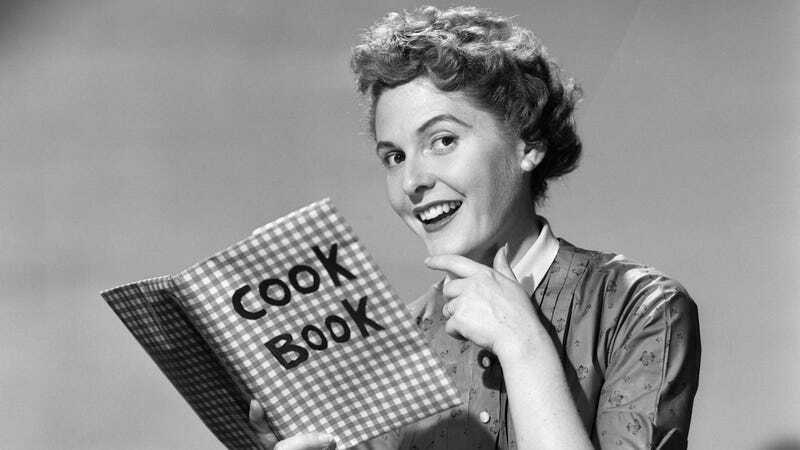 One reader said that they and their friends often take a vintage cookbook and make a dinner party out of it, with everyone picking a different recipe. Sounds like an awesome idea, although a recent shindig centered around a 1980s pâté cookbook failed, for somewhat obvious reasons. It looks like a popular submission was the 1912 collection A Thousand Ways To Please A Husband, With Bettina’s Best Recipes. Readers enthused, “Every chapter begins with a cozy story of how the character Bettina has cunning ideas of how to pull off a ladies’ luncheon on a dime. She then provides the recipe. I live for those stories” and “This thing is amazing… It has adorable drawings, poems, and stories about Bettina, always ending each chapter with her menu and recipes. Chapters have titles such as ‘Bettina Has A Porch Party’ or ‘Bob Makes Peanut Fudge.’” Hey, at least in such a patriarchal title, Bob still gets in the kitchen once in awhile. For the record, The Takeout is firmly pro-vintage cookbooks, especially ones published by churches. Read more about these and other fascinating selections at Gastro Obscura today.